'Tis the season for caps, gowns, tassles, and bittersweet goodbyes. While it's a little early for most high school graduations, a lot of college graduations are well underway, and students are reflecting on everything from painful all-nighters pulled and gallons of coffee downed during finals weeks to wild parties, greasy late night food runs, and good times shared with great friends. Some may get misty-eyed as the think about all the things they'll miss about their alma maters, while others are boldly looking forward, ready to dive into the next big adventure known as "the real world." Well, whatever your feelings are, congrats, grads! You've much to be proud of. Here we have a fluffy yellow cake infused with Soho lychee liqueur, a filling of Grey Goose vodka-soaked strawberry slices as filling, and an airy Soho buttercream frosting to really bring out the lychee flavors. 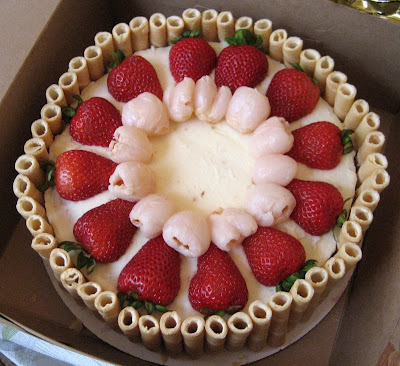 The cake is topped with fresh strawberry halves, whole lychee pieces, and is held together by golden pirouette cookies filled with sweet strawberry cream. 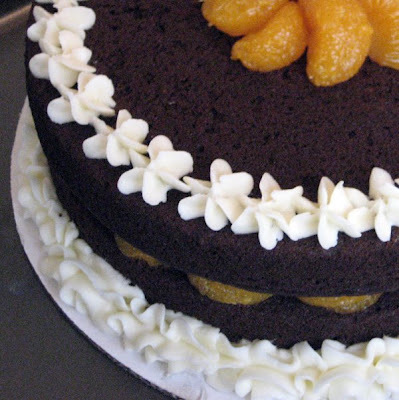 This is a rich bourbon chocolate cake made with Maker's Mark poured generously into the batter, a filling of juicy mandarin orange slices, and a Grand Marnier buttercream border piped around both layers of the cake. 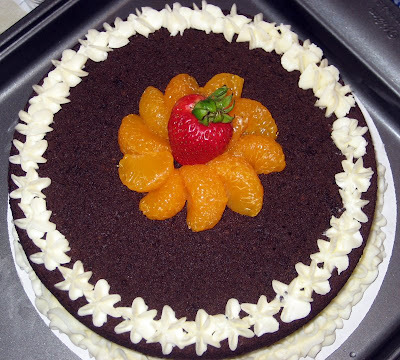 The Cocoa Clementine is topped with a whirl of orange slices and a blushing fresh strawberry for added flair. Thank you, Max! I hope you and your family enjoyed the cakes. And please wish your brother a hearty "Congratulations!" from Carrie Cakeaway and her very enthused assistant. 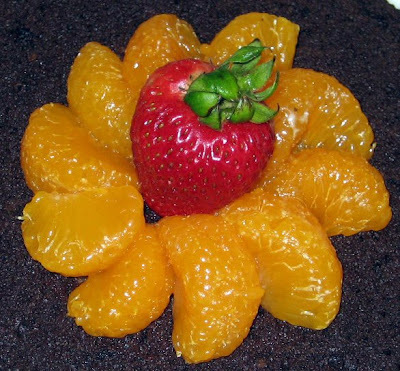 your creations continue to amaze me, and make me VERY hungry.